490 days and counting – that’s how long Australian offshore worker and AMWU union rep Troy Carter and his colleagues have been off work in a dispute with their employer. Their fight’s astonishing length, now well into its second year, isn’t the only thing that’s made this industrial dispute remarkable. These maintenance workers aren’t, after all, taking on any old boss; they’re taking on ExxonMobil — one of the biggest players in the one of the most lucrative industries in history. It all started in June last year, when ExxonMobil’s Australian affiliate Esso granted a new maintenance contract to contractor UGL after the previous 7-year contract had come to an end. Before, UGL and another firm held the contract jointly. Once UGL won it outright in 2017, 230 maintenance workers were immediately sacked — and then offered their jobs back at massively reduced pay and terms and conditions. “UGL had slashed our pay by 40 per cent,” he said. “Before we were on family-friendly seven-days-off and seven-days-on rotas. In the new contract, the wording stated that we would ‘work at the discretion of the company’ so in practice we could work 52 weeks throughout the year, with no clauses on equal time off. UGL scrapped all full-time work so that workers would from then on be on casual contracts; allowances were cut as were annual leave entitlements. Health and safety protections were likewise watered down. “Essentially they undercut everything we’d worked so hard as a union and a workforce to negotiate over the years,” Troy (pictured below) explained. UGL’s harsh ‘take it or leave it’ contract may seem to us so unjust as to be illegal – after all, if the same company took over the new contract, wouldn’t the collective agreement in place before still apply? But just like in the UK, rogue businesses in Australia attempt to exploit every loophole in employment regulations that they can get away with. In the case of UGL, they deliberately stalled on collective agreement negotiations until the agreement expired. Then, they coerced five workers from across the country who had never worked offshore to sign the new so-called agreement that, because of industrial laws loopholes, can apply to the rest of the workforce. Called ‘sham enterprise agreements’, they’re a tactic gaining in popularity among businesses in Australia. While the government has pledged to take action and courts have in some cases quashed them, sham enterprise agreements are still in many cases legal. 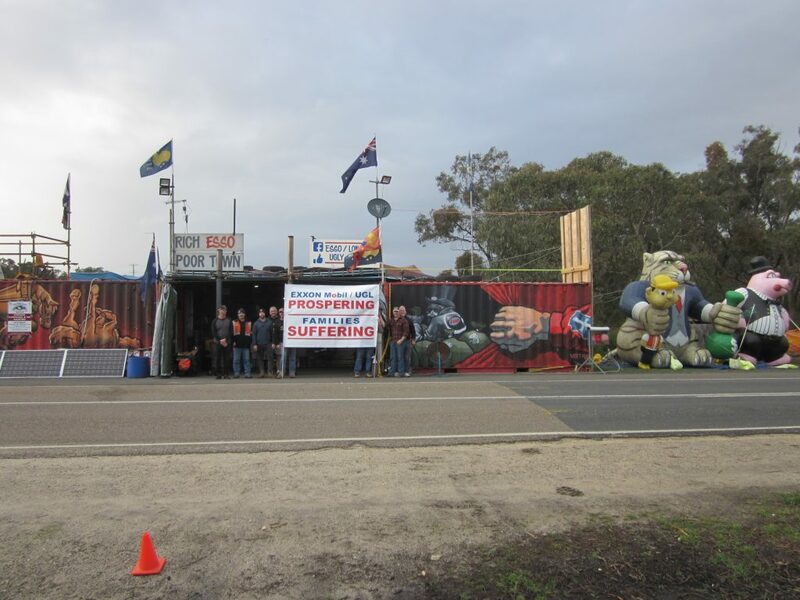 Seething from their employers’ betrayal, Troy and his colleagues, members of the Australian Manufacturing Workers’ Union (AMWU), the Australian Workers’ Union (AWU) and the Electrical Trades Union (ETU) refused to sign the new contract. “How could we possible justify this to our families – signing a contract that would take us away from our wives and children for longer with drastically less pay?” Troy noted. From that day forward the workers would picket outside the gates of the company (pictured above) for weeks on end. Their numbers have fallen as the dispute continues – from more than 100 people last year to 15 today. Since the workers’ protest began, they’ve maintained a picket line outside the site in Longford 24 hours a day, seven days a week. They’ve persisted even in the face of court orders banning the inflatable ‘Scabby the Rat’ and private investigators intimidating them by photographing their activity on the picket lines. Troy tells UNITElive that since their fight isn’t a strike in the technical sense of the term – the workers have lost their jobs – resolving the dispute will likely require a change in the law. While Troy and his union colleagues lobby the government in a campaign to change industrial laws so that sham agreements become illegal, they’ve also launched a campaign to expose ExxonMobil’s failure to pay any tax in Australia. “Through our research we’ve discovered that ExxonMobil has made in excess of $24bn from Australian resources since 2013 but have paid zero in corporate tax. They’ll maintain these tax concessions until 2021. For Troy, what’s kept him going are his wife and his two children, aged nine and four. Troy recounts the story of when he first told his kids about the dispute. In the last few months, the sacked workers have taken their fight globally. Most recently they’ve taken the story of their David and Goliath battle to Europe. 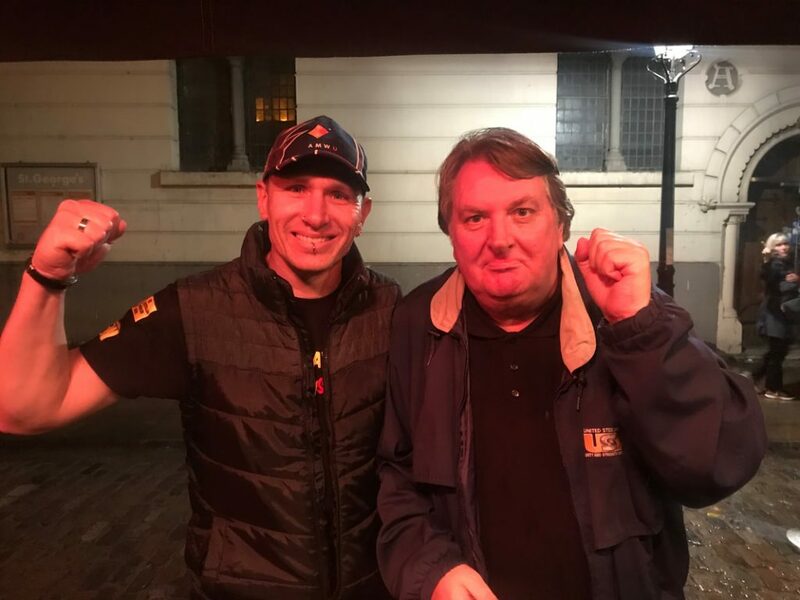 Last week, Troy attended a tax justice conference in Geneva and then travelled to the UK to meet with Unite leaders and oil reps in London and Aberdeen as well as the global union IndustriALL, which Unite is affiliated to. “We are fully behind the union members in the ESSO/UGL dispute – we are supporting them all the way,” said Unite assistant general secretary Tony Burke (pictured above with Troy Carter). 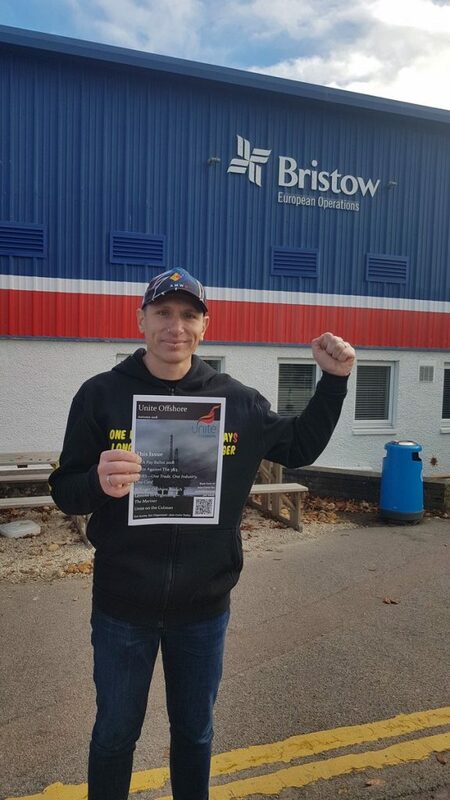 “It was an honour for myself and our oil industry reps in the UK and especially in Aberdeen to meet Troy and hear the inspiring story of their fight. These Australian oil workers have been treated appallingly by ExxonMobil and its contractors – their actions are totally unacceptable. Find out more about the Esso/UGL dispute and how you can support the workers here.